Investors may pause to lick their wounds Wednesday, after a recent rough ride. U.S. stock futures were little changed ahead of the opening bell, but CNNMoney's Fear & Greed index shows investors are still plenty nervous. Little wonder, perhaps, given the Dow Jones Industrial Average has fallen by nearly 7% since the start of 2014. For now, "exhausted" investor sentiment is in a "'wait and see' mood ... ahead of the U.S. employm ent data on Friday. Today's ADP is the pre-cursor to that," wrote Societe Generale analyst Kit Juckes in a market note. Payroll processor ADP will release its monthly figures on private-sector employment at 8:15 a.m. ET. That report is often considered a barometer of what to expect from the government's key monthly jobs report, due out early Friday. What's moving: Time Warner (TWX), the parent company of CNNMoney, announced a new $5 billion share buyback program as it reported slightly better-than-expected earnings. CVS Caremark (CVS) said it will stop selling tobacco products, starting Oct. 1. Merk (MRK) reported earnings and sales in line with forecasts, while GlaxoSmithKline (GSK) raised its dividend as it posted earnings-per-share that came in slightly below expectations. Twitter (TWTR) will report quarterly results after the close -- the first since last year's IPO. Shares of tech company ARM Holdings (ARMH) continued to slide after posting a sharp drop Tuesday. The company's shares have fallen by 20% since the start of 2014, making it one of the worst performers on the CNNMoney Tech30 index. 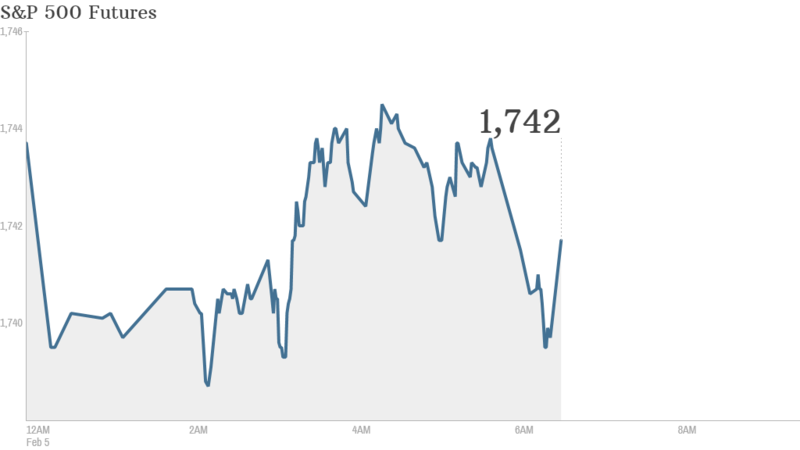 U.S. markets finished higher Tuesday, regaining lost ground after Monday's steep sell-off. European markets were mostly higher in morning trading following the release of positive economic data. Eurozone activity increased in January for the seventh consecutive month, according to Markit's purchasing managers' index, although the final reading was slightly weaker than the initial flash estimate. Meanwhile, Asian markets closed with mixed results. The Japanese markets clawed back some lost ground after posting a 4% drop Tuesday. Indonesia's economy grew by 5.7% in the fourth quarter, compared with the same period the previous year. That was better than expected and may calm fears about its ability to weather the storm battering the "fragile five" emerging economies.